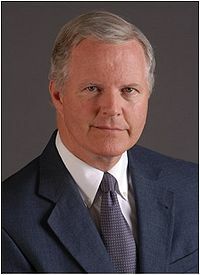 Tom Campbell (born August 14, 1952 in Chicago, Illinois) is an academician who served as a Republican U.S. Representative from California's Silicon Valley area for five nonconsecutive terms and Director of Finance for the State of California in 2004 and 2005. Campbell was a candidate for the Republican nomination for U.S. Senate to challenge Barbara Boxer in the 2010 election, however was defeated by former Hewlett-Packard CEO Carly Fiorina. Campbell earned B.A., M.A. and Ph.D. degrees in economics from the University of Chicago, during which his faculty advisor was Milton Friedman. He graduated from Harvard Law in 1976. Campbell served as a clerk for U.S. Supreme Court Justice Byron White, and went on to become a White House Fellow under President Jimmy Carter and Director of the Bureau of Competition under President Ronald Reagan. In the 1980s Campbell became a full tenured professor at Stanford Law School. In 1988, Campbell was elected to the U.S. House of Representatives and served until an unsuccessful campaign for U.S. Senate in 1992. After his defeat, he was elected to the California State Senate and was elected to the House again in a 1995 special election after his district was renumbered. He served on the Judiciary Committee, the Joint Economic Committee, the Banking and Housing Committee and the International Relations Committee. Campbell's record was fically conservative while socially moderate. He voted against the 1997 Partial-Birth Abortion Ban Act, and consistently earned high ratings from pro-choice groups. However, the conservative National Taxpayers Union Foundation named Campbell the most fiscally responsible member of Congress. His political leanings have gained him a libertarian following. In 2000, Campbell was the Republican nominee for U.S. Senate against Democratic incumbent Dianne Feinstein, but was defeated badly, even in his home district. After serving as Dean of the Haas School of Business at the University of California, Campbell was appointed by Governor Arnold Schwarzenegger to the Council of Economic Advisors. His tenure under Schwarzenegger led his primary Senate opponent Fiorina to make an ad contesting his fiscal conservatism, calling him a FCINO and comparing him to a demonic sheep. This page was last modified on 12 September 2016, at 19:50.